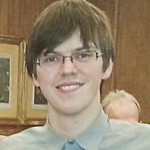 Toby Nonnenmacher (born in 1993) is originally from London, and began playing bridge at school. He first joined the U21 squad in 2010 playing with Michael Alishaw, and made his England debut in the Peggy Bayer in 2011. Toby continued to play on the U21 and, subsequently, U26 team throughout his time studying physics at Cambridge and Manchester University. He is currently back in London studying for a PhD in Particle Physics at Imperial College, and entering his last year on the England squad partnering famous English Bridge columnist Kyle Lam. Together they played on the 2017 U26 England team at the Junior Europeans, that qualified for the 2018 World Championships. Toby's game improved a lot during his time on the squad. He has represented England in the Peggy Bayer twice and junior Camrose four times with a 100% record in both and has won the Channel trophy Twice - once as a U26 and once as a U21. He has also played in two junior Europeans and one junior World Championship. Outside the junior squad, Toby happily plays with myriad partners. He won the Punchbowl trophy in 2016 playing with Ben Norton, the first National Swiss Teams congress with Ed Jones, and Division 3 of the 2017 Premier League with Andrew Murphy (on a technicality). Toby’s favourite bridge book is Raymond Semp’s Bridge Squeezes Interpreted, his favourite bridge based web content is “Bridge Memes”, and his favourite convention is transfers over 1NT. Having derived much inspiration watching the open game, Toby resolves to always be pleasant to partner, bring enough cough sweets to the playing area, and not go to prison for tax evasion. Toby looks forward to enjoying his last year on the squad and to any bridge successes he may have thereafter. His greatest bridge ambitions are to win the Bermuda Bowl, and to learn to count to 13, not necessarily in that order.